Something weird is happening when you decide to surf the Web. You have noticed that the default homepage of any browser is set to Goinf.ru. When you try to search for something on the Internet, you always end up on the go.mail.ru website. If you want to know what caused these changes, then the answer is short. Goinf.ru has taken control of your browser. We will provide you with all the necessary information about this browser hijacker and help you make a decision. 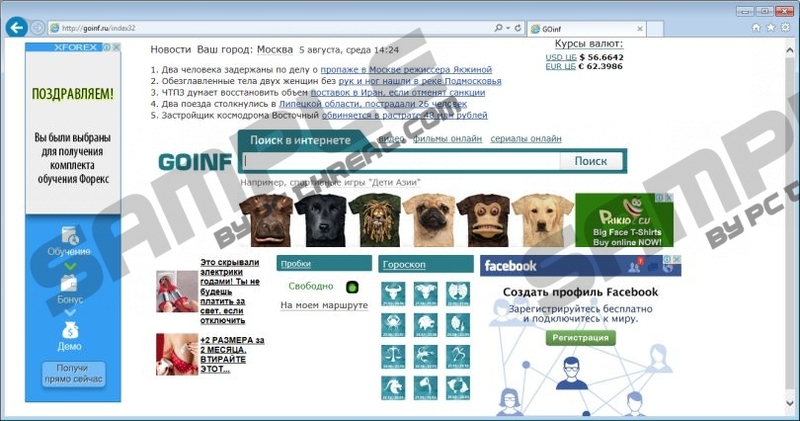 Our research has shown that Goinf.ru is a Russian product. It is distributed in packages with Russian software. In our case, the potential browser hijacker came bundled with a fake currency converter Currency Calc. Please note that you had a possibility to deselect Goinf.ru while installing Currency Calc but probably missed it by not reading the installation terms carefully enough. Let us give you an important security tip, always go for the Advanced installation mode. Evaluate every piece of software you are offered. There are many dangers lying in bundles. This time it was this worthless program, but the next time it could be malware bundled together with the application you want to install. To increase your safety, it is important to acquire a legitimate antivirus program that will locate every intruder. There is a slight possibility that you might have decided to give Goinf.ru a try and willingly accepted it. You will be disappointed with its functionality, as your every search will be redirected to the go.mail.ru search engine. This is because Goinf.ru was created solely for the purpose of promoting the latter search tool. Each time you find yourself on go.mail.ru, developers of Goinf.ru receive their reward because of the pay-per-click model. Moreover, not only will you find your searches redirected, but strange results will be shown for your search queries. We guess that the goal is to make you open unreliable pages, thus increasing their advertising value. Besides, each time you land on the Goinf.ru website, you will be, undoubtedly, irritated by pop-ups and video ads. The reason why you see them is the same: Developers of the search tool are desperately trying to make money out of you. Click on any ad and their mission will be successful. So, as Goinf.ru is a useless tool created only to generate money, it is the right time to eliminate the unwanted search engine. To achieve this, you will have to get rid of the program Goinf.ru came with. Open your program list and locate the unwanted application. Most likely, the unnecessary program was installed the most recently, and this will make your task easier. We have prepared a short guide that will explain how to perform this process manually. If something is still unclear to you, then it is better to seek professional help. Our support team is ready 24/7 to answer all your questions. You can always post your comment in the section below. Or, feel free to contact us via social media. Tap the Windows key + R to launch the Run box. Type control and click OK.
Go to Uninstall a program and remove the suspicious applications. Get rid of untrustworthy programs. Right-click on the Start button in the lower left corner of your screen. Quick & tested solution for Goinf.ru removal.